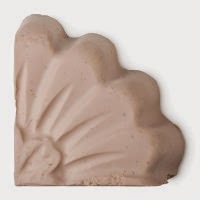 This face wash is a solid bar that contains calamine, chamomile, tea tree, elderflower, rose and lavender. Fresh Farmacy leaves the skin feeling incredibly clean, but it does so whilst being gentle and soothing. In regards to spots, it helps not just with them, but with redness too. It's calming, which is great in a face wash for oily and blemish prone skin as your skin can often feel out of whack. One of the best things about Fresh Farmacy though is that it is super affordable and lasts such a long time. I actually recommend buying a bigger block and chopping smaller pieces off as you go along. You'll find it to last much longer this way as the entire bar doesn't get wet every time you use it. When it hits water it will start to disappear, so by chopping off smaller pieces you will save more product in the long run by keeping the rest dry. Also, as it's Lush, they are usually incredibly fantastic with providing you with generous samples to try out. If you don't fancy splashing out straight away but want to give it a go, you can simply pop in store and ask for some assistance and a sample. You can purchase Lush's Fresh Farmacy from £4.95 from Lush. The Body Shop Tea Tree Skin Clearing Facial Wash is designed to remove impurities and excess oil without over-drying the skin. 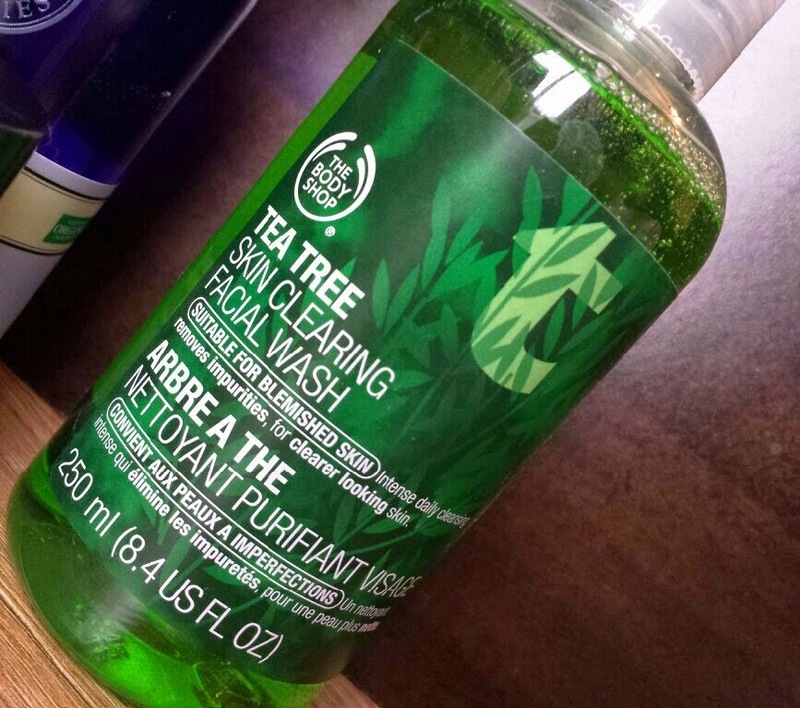 I have written a more extensive review of The Body Shop Tea Tree range in the past, but I'll discuss it here briefly too. If you are looking for something refreshing as well as effective, definitely give this one a go. It helps to wake you up in the morning thanks to its addition of menthol, so it's not just an anti-blemish product, but a nice and zingy experience too. It helps to reduce spots and oil without leaving your skin tight, dehydrated or dry. It also lasts for such a long time as you barely need any to create an effective, all-over lather. As with Fresh Farmacy, this face wash is incredibly affordable. It's great value for money and the results that you see for what you pay are pretty darn impressive. You can purchase The Body Shop's Tea Tree Skin Clearing Facial Wash 200ml for £5 from The Body Shop. Whilst not the cheapest on the list, Clinique's Anti-Blemish Solutions Cleansing Foam is definitely a product that shows some results. It is an incredibly gentle cleanser that doesn't aggravate the skin or any existing blemishes, but you can find yourself running low fairly quickly. As soon as you press down on the pump, the product will be dispensed as foam. I have always found foam based products to be the quickest at being used up. Hopefully I'm not alone with this observation, but I always found myself having to re-purchase this product often due to it. It's worth keeping in mind if you find this to happen too. Clinique recommend 2-3 pumps, but I always found that a little excessive. Depending on how much you prefer to use in one go, you may want to be careful with how hard you press down on the pump or with how many pumps you use. It is very easy to rinse too, so is a good choice if you tend to be in a hurry. There is definitely a noticeable difference in regards to spots, oil and redness, so even though it disappears quickly it still provides results. 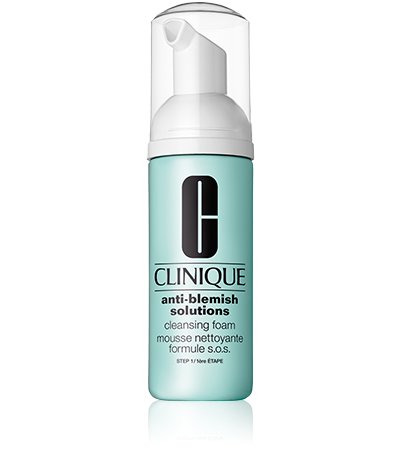 You can purchase Clinique's Anti-Blemish Solutions Cleansing Foam 125ml for £17 from Clinique, Boots or Debenhams. The Avene Cleanance Soapless Gel Cleanser is an ultra mild face wash for oily, blemish-prone skin. This facial wash is great because even though it is soap free, it lathers up really well and leaves your skin feeling cleansed, soft and super comfortable. It doesn't aggravate existing spots and helps to gently clear them and future blemishes up too. It's also very helpful with reducing excess oil without being overly drying. In addition, it also has a beautiful clean, fresh smell to it. This is a mid-range price product, but one that lasts quite a long time. Therefore, it’s worth the money spent if you also see results from it. You can purchase Avene's Cleanance Soapless Gel Cleanser 200ml for £11 from Boots. 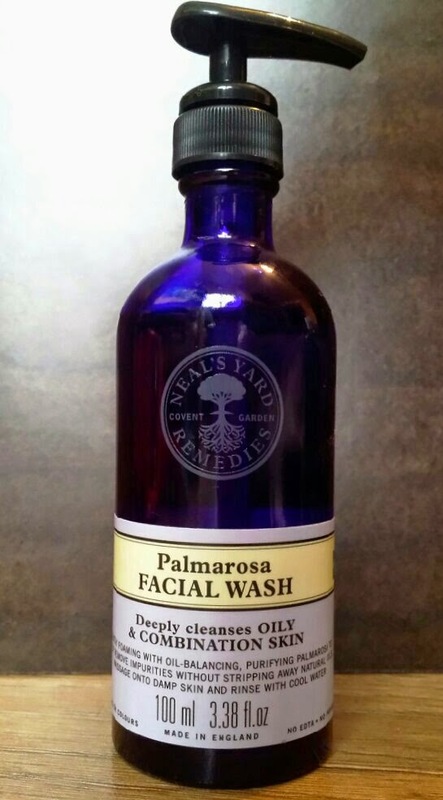 Neal's Yard Remedies Palmarosa Facial Wash is natural, organic and not directly advertised to those with blemish prone skin. It it advertised to those with oily or combination skin, though. I have written a more extensive review on the Neal's Yard Remedies Oily/Combination Skincare Discovery Kit already which includes my thoughts on the facial wash. This, along with the next product on the list, is one of my personal holy grail products. This face wash has been a huge surprise and an incredible success in regards to blemishes. The Palmarosa Facial Wash deeply cleanses oily or combination skin to remove impurities without stripping the skin of natural oils. It includes palmarosa, tea tree, elderflower, nettle extract, calendula, lemon and frankincense. As with a couple of other products mentioned on this list, a small amount goes really far. Therefore, a full-size, 100ml bottle will take you a long time to make your way through. This makes the product fantastic value for money. It doesn't work overnight, as no products really do, but if you give it time (note: roughly a couple of weeks or more) then you, like myself and others (check the reviews), may begin to see some results. Oil will be reduced and blemishes simply begin to disappear. It's amazing to see it happen and it truly makes you feel good about your skin. You can purchase the Neal's Yard Remedies Palmarosa Facial Wash 100ml for £15.50 from Neal's Yard Remedies or John Lewis. 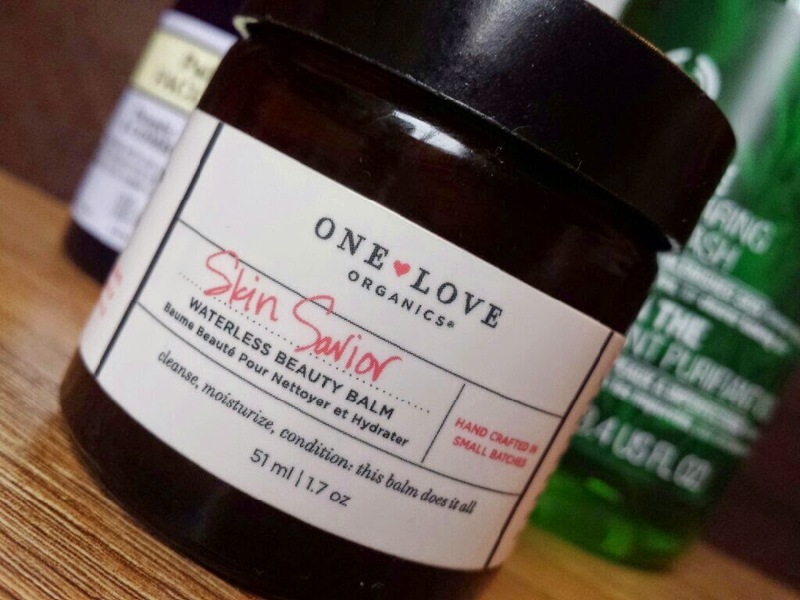 Another one of my holy grails that I have mentioned a few times on this blog already (including my 11 uses for One Love Organics Skin Savior Balm post), this product had to make an appearance. I'm going to discuss this product from a cleanser point of view (it really is a multitasker). I tend to use it at night as a face wash, after removing my makeup. To use you need to apply a small amount of balm to the skin, massage gently and then wipe off. Simple! And best of all, when I say a small amount, I really do mean it. A pot of this stuff may sound expensive, but it's the longest lasting product out of the entire list. There is no foaming or lathering with the Skin Savior, but the results are outstanding. You will be left with the smoothest skin that you have ever had in your life, and if used over time, you will also begin to see a difference with your blemishes. I stopped using this product for a short while after I ran out, and all of the progress that was made with my skin was reversed. Reverting back to a different wash brought spots back out to play, but it all disappeared again when I began using it again along with my new find, the Palmarosa Facial Wash.
You can purchase the One Love Organics Skin Savior 1.3oz for £27 from One Love Organics or £30 from Birchbox. Alternatively, you can buy the larger 3.5oz jar for £52 from One Love Organics. The Skin Savior covers everything! So there we have it! My Top 6 Facial Washes for Oily, Blemish-Prone Skin! What are your favourite facial washes? Have you tried any of these out already?